Create a comfort zone with Rapid Cool’s indoor and outdoor mist cooling systems. Rapid Cool’s misting systems cool the air by 25 degrees! We offer misting systems for many applications and provide expert help to design a system to meet your needs. Many other misting companies want you to buy online, but when you contact us at Rapid Cool, you receive expert advice and help to select the right equipment the first time. Let us help you! Call us at 818-519-2818 or fill out the form and tell us what you need. Create a comfort zone with an outdoor mist cooling system. Let Rapid Cool keep your outdoor areas comfortable for patrons, clients, family, pets, and friends. Rapid Cool mist cooling systems allow restaurants to maximize valuable seating capacity during peak operating hours. 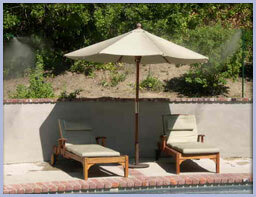 Home use provides added outdoor enjoyment during those hot summer days. Systems designed for pets provide an economical way to keep your animals safe and cool in extreme temperatures. We also offer an economical solution for humidification in a wide variety of industrial and commercial applications. Let us design a system that suits your needs. Looking for a special effect? Using state of the art technology and equipment, allow us to create that special effect for you. Specially designed fog nozzles that operate under high pressure can create the dramatic effect you may be looking for. 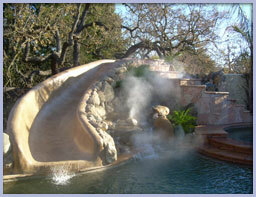 Rapid Cool systems do not require harsh chemicals or extreme temperatures to produce these special effects. Smoke and fog effects utilizing pure water are rapidly becoming an acceptable alternative in the entertainment industry and are safe and affordable.